You got your child to watch Karate Kid starring Jaden Smith and Jackie Chan, as Jaden's martial arts trainer, and later on, you find your child doing some martial arts moves in the backyard. You may not know it but involving your kids in martial arts has more benefits than disadvantages. And what’s so great about this is that your kids will absolutely love doing it as well. If involving your kid in sports is a way for you to strip off some of their digital time, you may also opt for your child to stay healthy through any type of active sport. So, in the process why don’t you include martial arts for kids in your list of sports with your child in mind? There are many reasons why martial arts are good for your kids, and here are the reasons why. Obviously, martial arts have their physical benefits. It will keep your kids in tip-top shape from the get-go. Martial arts are not just running sports or any sport that mainly uses the upper body. It is a sport that really requires the entire body to move. Every single part of the body is used in martial arts. One thing you will really love about martial arts is its mental training. It is true that across the martial arts world, you will learn that every art starts with a mind set. Martial arts believe that a healthy mind is a key to a healthy body. And true enough, a healthy mind really does prove to be very effective in keeping the body stay in a healthy and active lifestyle. Surprisingly, martial arts make your child understand their bodies better. Your kid will discover things that he would never have imagined he could do. A great thing about this is that your child will realize that his body can do whatever it wants as long as your child puts his mind into it. Your child has many potentials and signing them up for martial arts is something that will further encourage them to trust their bodies and explore their selves. They also end up testing their limits and even going beyond it. Although martial art is an individual sport, your child will still receive all the same kind of support from each other. The great thing about this sport is that everything is achievable and that no one ever sits on the bench. There is always a level higher that they can advance to. The belt system is a great way to motivate the kids to go beyond. Each level includes more difficult moves and more tiring challenges that your kids must try to finish and endure. Every belt they get gives them an extra boost of confidence. Martial art is built for every kind of person and for every type of body allowing it to be able to maximize its functions well. Enrolling your kids is not just something that will help them; it will help you as well. Home training is often advised and there are instances where you are also involved in the training that gets you and your child into the sport. This adds to your bonding experience with your child. 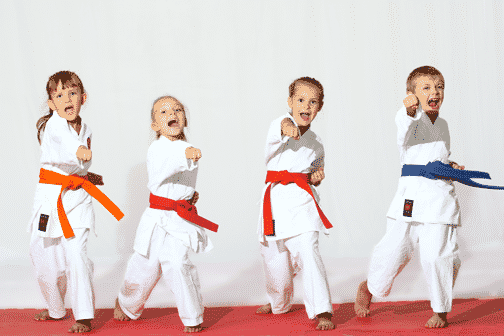 Even though you have an idea of the mainstream children's martial arts available, you need to answer the question, 'Are there martial arts for kids near me?'. This is a toughie. Even if you want your child to be involved in karate but the only martial arts nearby offers Taekwondo, you should consider the option too. You really need to do research on how much it would cost you to enroll your child in long term. Don't think that martial arts would only be a short term thing your child will eventually get tired of. It is surprising that the drop out rate for martial arts is very low. It really needs your dedication and investment if you really want your child to try out martial arts. Now that you know what martial arts classes are nearby, you need to check it out first—alone! Don't bring your kid yet. Learn about the place your child will be practicing at and also learn more about the sensei. The teacher needs to be well-trained and also a great teacher. You need to observe how one class is held and learn whether or not your child will suit the environment and the teacher. Finding the teacher for martial arts classes are really the needle in the haystack since it is the most important part of enrolling your kid into martial arts for children. Do some research first. Are the martial arts classes near you have a record? How high is the dropout rate? Is the dojo a safe environment to put your child in? How well does the martial arts facility work in the community? Here are the top five choices in helping you decide what's what and what will do your kids well. Why your kid should enroll and what to expect? As one of the most popular martial arts around the world, Karate is no wonder that it is what most parents would normally enroll their kids in. One great aspect about karate is that it builds your child's body to make really quick responses and advanced reflexes. Karate comes from two Japanese words 'kara' for empty and 'te' for hand, literally means empty hand. Karate exclusively uses the entire body for defense and makes the offense, and it teaches the body to have powerful kicks, strikes, and defensive blocks. It involves a lot of powerful snaps using the joints which require your children to warm up properly and it also teaches your kids a great deal of patience. Karate classes for kids are created not for the sake of fighting but to direct the person to the path of knowledge. It teaches a great deal of self-respect and courtesy to others while in the process of teaching the body to learn its capabilities and to defend itself in case of trouble without the use of weapons and other stuff. Taek Won Do is known to be the best martial arts for kids because your child learns self-defense and self-control. Taekwondo is seen as a way of life as it learns a series of doctrines that your child must follow and these doctrines are applied in daily life. In fact, these doctrines are known to have come from the Five Codes of Human Conduct. It covers not just the body but the entire way a person lives and it focuses on meditation and the development of self-control. This is mainly a kid's martial arts for self-defense. You will notice though that Taekwondo is actually a sport that involves great speed and agility. One thing we love about taekwondo is that it really does well for kids who suffer from Attention Deficit Hyperactivity Disorder (ADHD) and other forms of hyperactive disorders. You will love that your child will learn more than just defending their self but will also learn how to be strong in facing difficult situations even in school and studies. Everything your child learns is applicable in every aspect of their lives and teaches them how to be more mature and more controlled. Although your child learns how to fight, this martial arts teaches your child to deal with situations properly first before actually engaging in combat. You will end up learning a lot too especially in dealing with impatience and even stress you get from work. We suggest that you take taekwondo classes with your child. Originally known as jujutsu, this sport focuses on a more competitive side of martial arts. It uses the opponents' strength, weight, and attacks as means to defend oneself. Jujutsu is in a sense powerful because it uses little effort in defending making your child become strong in delivering offense. Although it teaches powerful combat skills, you cannot remove discipline from jujutsu. All practitioners learn how to cooperate with one another and still become disciplined and well-respected individuals in the process. This is also quite ideal for girls because it uses graceful moves. It is a martial arts class for kids that prevent discrimination among genders, ages, and abilities. Furthermore, it is a very versatile form of martial arts because no matter where you go or which dojo you transfer to—even if it's a karate or taekwondo dojo—your child can still practice Jiu Jitsu. Regarding physical aspects, these martial arts classes for kids do a complete body workout. It teaches your child to make blocks using the entire body in a graceful or fluid manner. It's like dancing with your opponent, and one thing that is great about this is that it is practiced by NFL players and professional rugby players to improve their skills in playing the game. One aspect of aikido that is highly suggested by martial arts practitioners for kids is its versatility and its counter combat skills. This means that Aikido is a gentle form of martial arts that literally redirect an opponent's energy towards themselves. To make it simpler to understand, it means that instead of defending yourself through the offense, you simply use your opponent’s strength against himself. In a sense, you're making your opponent fight himself. It is a very practical martial art for kids that will teach defending oneself, and one thing we love about it is that even children with special needs like autism and socially impaired kids can practice. You'll love that aikido does not promote violence but steers away from it. It is actually a martial art designed to prevent the use of brute force and promotes self-control. This is also perfect for children who are overweight and obese. Although all martial arts are great to combat obesity, aikido does not require much of the body. It needs a lot of warm-up exercises and most of the moves involve muscle building and body strengthening in simple strict moves that eventually leads to a great weight loss routine. This is probably the most energetic form of martial arts for kids. Kung Fu is in a sense the Chinese Karate but Kung Fu is more graceful and less taxing on the human body. One of the best aspects of Kung Fu is the real fun a child gets from it. It is a fast-paced martial art that requires a lot of movement. Despite its active form, it also focuses a lot on meditation so that your child will learn how to connect his body with his mind. This great mind-setting allows your child to balance activity and meditation. It is a great sport for kids who suffer from ADHD and other hyperactivity disorders as well. What's great about Kung fu is that it isn't as demanding on the human body as karate because it feels more like an aerobic exercise. As compared to karate, Kung Fu uses daily instruments like a stick, poles, fans and whatever it is that is lying around the house. In case of danger, your child will be able to use anything at their disposal as a form of defense. Kung Fu also derives most of its moves from nature teaching your child not only to reconnect to his body but to nature as well. Other forms of martial arts for kids that are also great for them are T'ai Chi and Judo. T'ai Chi focuses more on the body's flexibility, balance, weight-bearing moves, and stretching. Judo, on the other hand, is like Jujutsu. It is a competitive martial art that uses balance and weight to disadvantage your child's opponent. Whichever martial art you choose for your child, you will never go wrong in enrolling them in it. Martial arts are not designed for combat but are taught to make your child more disciplined and more respectful. It involves more on teaching the mind to teach the body to obey. And this is a great tool to not only reduce digital time but to increase a happier, leaner, and healthier child.